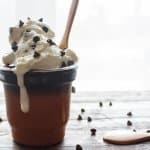 Baileys Chocolate Chip No-Churn Ice Cream, homemade Ice Cream made with four ingredients, fast, easy and so delicious. I am pretty sceptical when it comes to trying new and or weird combinations in food. I like classic. And this Baileys Chocolate Chip No-Churn Ice Cream was new to me. 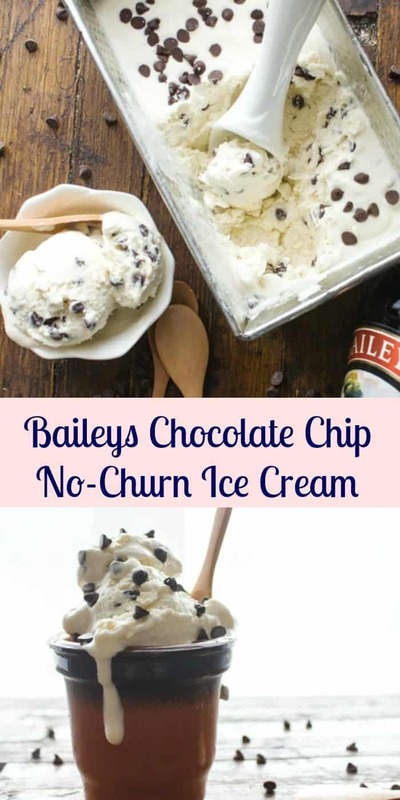 But when I saw the amazing No-churn Ice Cream my friend Marissa at Allourway was making, I thought with all the ice cream that is eaten in my house I have to try that. Basically you only need 2 ingredients, sweetened condensed milk, which I can find in Italy, and cream. And then of course you can add anything and everything. So I decided, since St Patrick’s Day is just around the corner, and yes I have some Irish blood along with Italian in me, this would be the perfect combination. My cousin’s co-worker once asked her what her background heritage was, and when she responded “Italian and Irish”, their response was “Ahhh so you can eat and drink”. So yes my friends we can! We are a talented bunch. 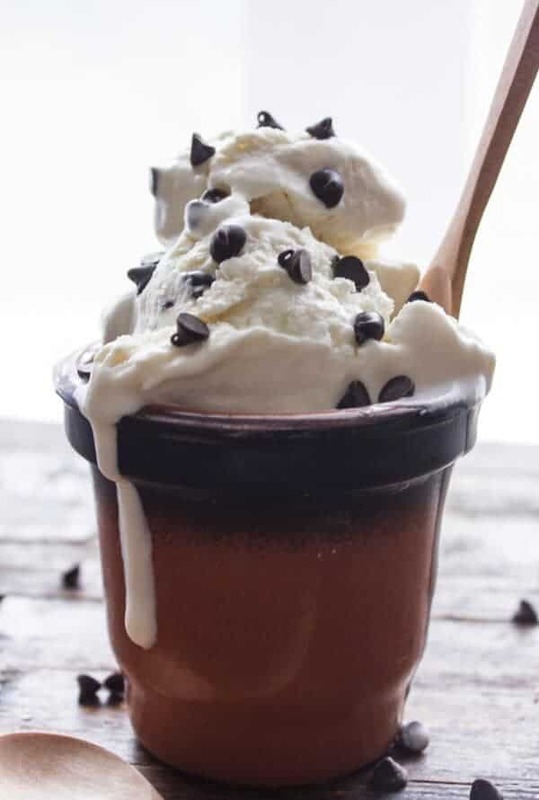 So I decided my first attempt at no-churn ice cream was calling for Baileys and chocolate, I know I am always saying how I love this, that and the next thing. But seriously chocolate?! 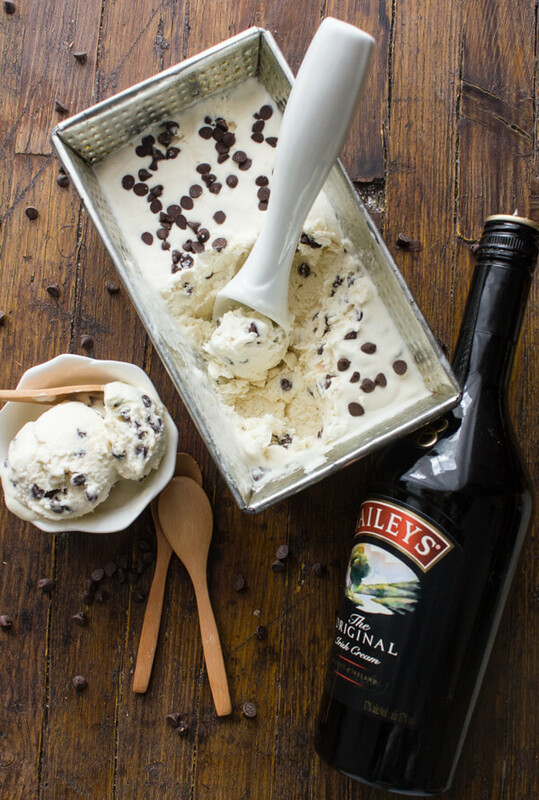 So I decided to make a No-Churn Baileys Chocolate Chip Ice Cream. I even made it a little healthy by adding dark chocolate chips ;). Let me tell you this is the fastest and easiest and did I say yummiest Homemade Ice Cream I have ever made. It is so creamy, my daughter and I ate it all before my husband got a taste! 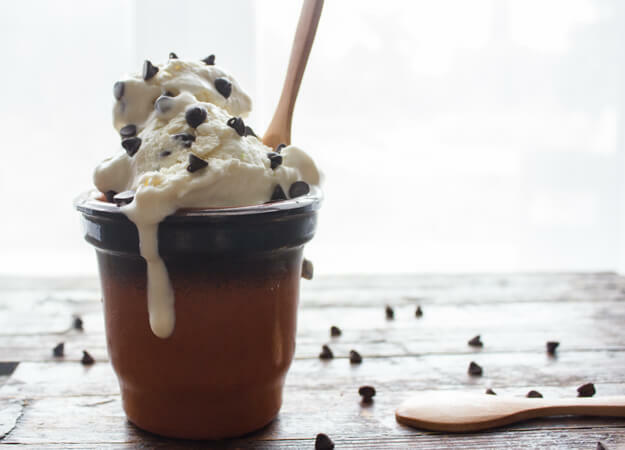 So naturally I had to make this No-Churn Baileys Chocolate Chip Ice Cream again, but of course we didn’t complain! To tell the truth I don’t think my Ice Cream Maker will be seeing much work anymore. Enjoy! 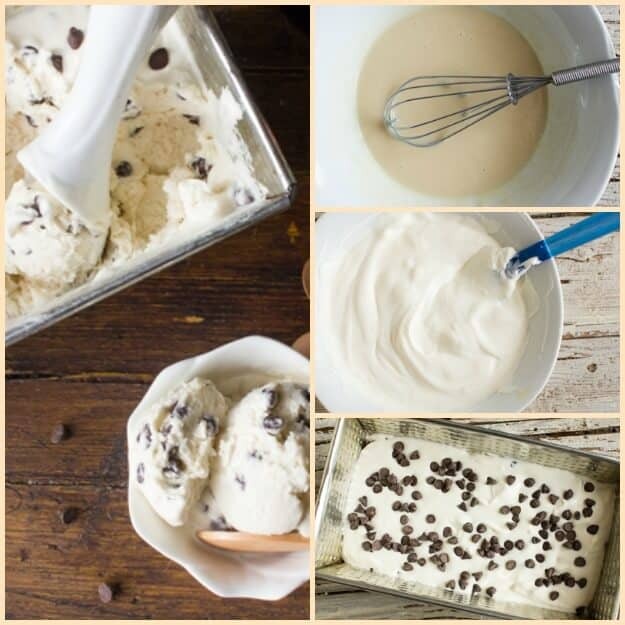 Baileys Chocolate Chip No-Churn Ice Cream, an easy, simple no-churn ice cream recipe. Only four ingredients, creamy and delicious. In a small bowl whisk together Baileys and sweetened condensed milk. Whip cream until stiff (be careful not to make butter). Add a little whipped cream to the Baileys mixture to make it easier to combine, then fold in the rest of the whipped cream mixture into the Baileys/sweetened condensed milk mixture. Place 1/3 into the loaf pan 8x4 inch (20x10 centimeters), top with 1/3 of the chips and continue with the layers until complete. Place in a large ziplock bag and freeze at least 3- 5 hours until frozen or even overnight. Enjoy! So how much of ingredient 2 should I use? I’m in the UK, is whole cream the same as double cream? Hi Soo, sorry about that, so reweighed the ingredients and added the correct amounts. And yes double cream and whole cream are the same. As long as it has 30% or more fat than that is the proper cream to use. Hope that helps. Let me know how it goes. When you say whip the cream until stiff, is that using an electric mixer? Hi Lorr, yes with an electric mixer. Let me know how it goes. This looks wonderful Rose and thank you for mentioning me. I bet with this method of making ice cream your ice cream maker will stay in the pantry 🙂 I already thinking of all the great fresh fruits that are coming up, aren’t you?? Love Baileys and this will be a definite make in our house!! Have a wonderful weekend. Hi Marisa, your welcome, I was always intrigued by your no-churn ice cream. My daughter has already decided that this ice cream is the best. Thanks have a great weekend to you too.